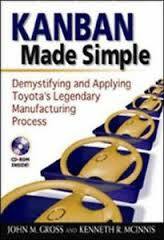 245 1 0 %a Kanban made simple : %b demystifying and applying Toyota's legendary manufacturing process / %c John M. Gross, Kenneth R. McInnis. 260 %a New York ; %a Atlanta : %b Amacom, %c cop. 2003. 300 %a VIII, 259 s. : %b il. ; %c 24 cm + %e CD-ROM.